This week we’re gong to take a look at Image Quality, from the perspective of varying each element that makes up the Exposure Triangle and then observing the impact. 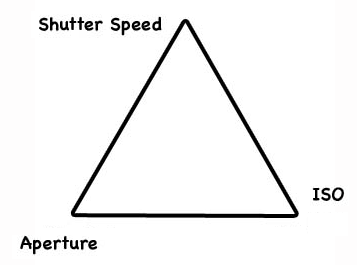 Now, the Exposure Triangle is a concept that allows us to understand the interaction between ISO, Aperture and Shutter Speed. Change any one of these and the others have to compensate in order to produce an equal/equivalent exposure. As a result this has some desirable/controllable impacts on image quality and some less desirable impacts, and that is what we’re going to explore here. In the days of film, we’d basically work at one ISO setting and just vary the shutter speed. More light faster shutter speed, less light slower shutter speed. Simple. Nowadays, we can also hold the shutter speed constant and vary the ISO (light sensitivity) less light, more sensitive, more light less sensitive. We could also hold the aperture (Depth of Field) constant and then vary the other two elements, can you guess? More sensitive, faster shutter speed, less sensitive, slower shutter speed. but none of these conveniences of choice come without their pros and cons. So, what are they? You take a look. We know that if you open up the iris of the lens, more light comes in, and if you stop down, less light is allowed in. As a result, less or more of the picture is in focus. That is, with regard to image quality, image sharpness and detail is strongly influenced by Depth of Field. Take a look at these shot of my son, standing two meters away from my APS-C camera on which I had a “35mm f/2” lens mounted. What do you notice in these images as I stop down from f/2 to f/22? ISO Numbers are the current way in which we rate the sensitivity to light of a particular film or sensor. In general, the lower the ISO Number, the more detail, and colour contrast is available. The higher the ISO Number the more artifacts, like grain in film, or pixel noise in the sensor (hot pixels) star to appear. This generally results in a loss of sharp detail and reduced contrast, flatter or muted images. Take a look at the following outdoor scene as I shift from ISO 100-12,800. how do the images change? What happens to their overall image quality? At which ISO would you say that my camera works best? OK, same exercise, but this time in low light at a long slow shutter speed, 30 sec. Do you notice any difference in image quality due to the slow shutter speed? Does this compound the noise at higher ISO settings? I suggest you go out and try this for yourself with your own camera. By exploring this, you will gain a greater understanding about how your camera reacts under various lighting conditions, better understand the quality of images your camera produces, and be able to select optimal settings for different lighting conditions, rather than just let your camera do it for you.